The interaction of the atoms on the surface of the various layers in MXenes give these 2D materials their exceptional properties. Image: Drexel University. Amidst a surge of research over the past two decades focusing on the special properties of two-dimensional (2D) materials that are just an atom or two thick, researchers at Drexel University have steadily been uncovering the exceptional properties of one family of these materials, called MXenes. Researchers now know that MXenes are highly conductive and extremely durable, able to block electromagnetic interference, sense chemicals in the air, remove salt from water and capture hydrogen. These 2D materials have made a strong case to be involved in the future of energy storage, wireless communication and wearable technology. But before that can happen researchers need to understand why MXenes can do what they do – and how they can be designed to do it better. As 2D materials, MXenes are largely defined by their surfaces, yet researchers are in the early stages of directly measuring how the surface chemistry of MXenes influences their performance. Researchers in the Dynamic Characterization Group in Drexel's College of Engineering recently addressed this question in a paper in Nature Communications. Their study suggests that engineering the atoms bonded to the surfaces of MXenes and the molecules intercalated between their layers could dramatically improve various properties of the materials. 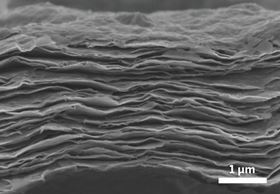 "While the idea of controlling MXene properties by changing their surface termination and intercalation has always been a key objective in advancing these materials, we are the first to directly achieve this goal and lay the groundwork for engineering these materials to improve conductivity and explore the possibility of developing semiconducting, magnetic and topologically insulating MXenes," said Mitra Taheri, professor and head of the Dynamic Characterization Group, and lead author of the paper. "The holy grail is to have control over what goes on 'between the sheets', so to speak. We are demonstrating a major step toward termination engineering through the use of novel in-situ TEM [transmission electron microscopy] techniques and our direct detection spectroscopy technology." MXenes, which were first discovered at Drexel in 2011, are made by chemically etching a layered ceramic material called a MAX phase to remove a set of chemically-related layers, leaving a stack of two-dimensional flakes. Based on the exact chemical etchant used, the atomic species left bonded with the flake surfaces – the termination species – and the molecules that get stuck in between the flakes – the intercalants – will vary. Researchers have speculated that the interplay between the MXene, the termination species and the intercalation species can influence MXenes' conductivity. Some 30 different types of MXenes have been produced at Drexel, and this study looked at the behavior of three that are frequently explored for applications. The goal of the researchers was to measure the conductivity of these materials before making any alterations, and then to monitor it as they removed intercalants and altered the surface chemistry of the flakes. To do this, the team incrementally heated the materials in a vacuum to temperatures as high as 775°C. During the heating process, the team monitored both the electronic resistance of the material – as a way of determining its conductivity – and the chemical dissipation, or de-intercalation, of the intercalants in real time. To make these measurements, the researchers used a technique they'd previously developed called direct detection electron energy loss spectroscopy, which is ideal for monitoring chemical changes in 2D materials. Using the same process, they were also able to monitor and study the release of the termination atoms from the surface of the MXene flakes. In both instances, measures of the electrical resistance of the flakes revealed that they became more conductive as intercalants and termination species were eliminated. "In our study, we started with MXenes that had a mix of oxygen, hydroxide and fluorine termination species, and we showed that as you partially remove these surface termination groups, the conductivity increases significantly. This is also true as water and organic molecules are de-intercalated," said Jamie Hart, a doctoral researcher in the Department of Materials Science and Engineering and a co-author of the paper. "Importantly, by testing these materials in the electron microscope and measuring them with electron energy loss spectroscopy, we were able to establish a causal relationship between intercalation and termination loss and improved conductivity." Though this confirms a theory that has been speculated upon for some time, Hart notes that it has been nearly impossible to accurately induce, track and measure the effects of these chemical changes until now. So this discovery is significant not only because it shows the source of MXenes' behavior, but also because it indicates how that behavior can be altered. "Most experimental studies looking at MXenes are geared toward a specific application – for example, using MXene to make a battery and optimizing the fabrication and design to maximize battery performance," Hart said. "Our study asks fundamental questions about the properties of MXenes and our findings provide clear guidelines for how to improve conductivity in MXenes, which should directly translate into improved performance for applications such as antennas and electromagnetic interference shielding." These findings are an important step toward optimizing MXenes for various applications – wearable electronics, energy storage and electromagnetic interference shielding are among those on the horizon – as well as understanding how to make them stable in atmospheric conditions for extended periods of time. They also point the way toward creating magnetic MXenes that could be used for data storage devices. "This sort of research is foundational to the development of MXenes and their eventual integration into the devices that improve our day-to-day lives," said Kanit Hantanasirisakul, a doctoral candidate in Drexel's College of Engineering, and a co-author of the paper. "It will be exciting to follow the progress of MXenes now that we have a better understanding of how to control their properties."